My last few days in Prague were spent sightseeing before setting off from Libor’s for Germany. He’d given me a great route to take and by the end of the day I was only 10kms from the border at Babylon. A nice ride with undulating scenery, then the next day it was an uneventful border crossing at Furth im wald and on to Cham. Now I’m in the EU I’ve missed the ‘Welcome to Wherever’ signs. There was something about them that made it more exciting to cross a border whereas now I just drive from one country into the next. Ah well, change happens. I met a great guy Mensik at Moto pension before leaving the Czech Republic who took me to his bar and made it his mission to feed me. He must have known I’d lost 10kgs since starting out as he kept offering me food til I couldn’t squeeze in another bite! And thanks to Libor, the back wheel is now true again and the engine is running well. When I stopped at a gas station a guy I met handed me his phone, only to find Libor on the other end. He has friends everywhere! 6/9 Unfortunately after 170kms today the bike’s been vibrating badly and the engine is really showing signs of age. I’ve been having to stop often and run at around 45 to minimize the vibration. Whether Effie can make it another 500kms is questionable but during my routine inspections I did discover the muffler had broken away and there was a piece rattling around inside so hopefully this is what caused the vibration. Still keeping those fingers crossed! 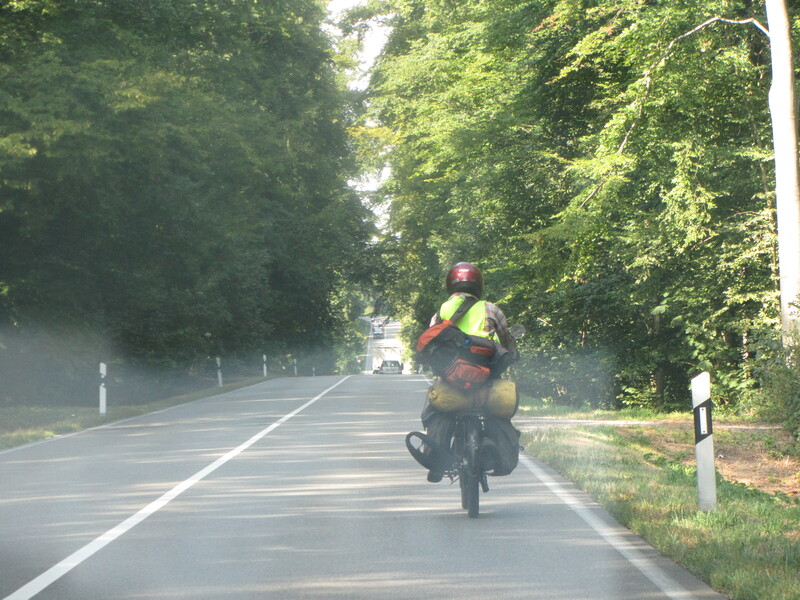 I had a funny incident while camped near the road when a guy stopped and suggested I move further away saying that it’s illegal to wild camp in Germany and where I was situated is a popular place for the police to set up their speed cameras. So I packed up and moved into the trees out of sight of the road. Around 9pm two men one in army fatigues, arrived and suggested I move 300 metres away as they were hunting wild boar and I was in their line of fire! The three of us picked up and carried the tent to a safer location. I did say to them it was ironic that I’ve been through countries considered dangerous by most people and yet I now found myself a target of hunters in Germany! I finally made it to where I was to stay in Stuttgart after a very stressful ride with heavy traffic and less than easy instructions. After having pushed the bike up the hill the lights changed on me and it was back down to do it all again. This is the part where it’s no longer fun. It’s just bloody hard work. It was 4 degrees when I set off that morning and I’d slept without socks so my feet were frozen. Thankfully the day warmed to 20 degrees so lovely riding weather, but I can definitely feel winter is on the way. Lynne arrived by train from Nuremberg and we spent a day or two recovering & catching up with mail, photos, diary and the blog. This is always a top priority as it doesn’t take long to lose track of what’s been happening. One of the things I wanted to do was retrace the Bertha Benz Memorial route. For those who don’t know the history of this drive, Bertha was Karl Benz’s (inventor of the Mercedes Benz) wife. One day in 1888 without Karl’s knowledge & while he was away, Bertha took the car (as yet untested over such a distance) and drove it 106 kms from Mannheim to Pforzheim and then a few days later drove it back again. There was no petrol in those days given there were no cars, so Bertha stopped at a pharmacy for alcohol instead. She used a long hairpin to clean a fuel pipe and a garter to insulate a wire. On her arrival in Pforzheim she informed Karl by telegram of her success. Because of her observations on the journey Karl made changes to the car like a lower gear for the hills and improving braking power. Now there are markers beside the roadway, which winds through the Black Forest commemorating this amazing achievement. This picture is me chugging along on the route and it was an honour to ride Effie in her footsteps. What a woman! I did get lost at one stage and had to wonder if Bertha had too. One of the blog followers had sent an invitation to stay with him in Bruchsal and on arrival I met up with Daniel, a fellow FN owner who graciously gave up his time to make us welcome. A few hours was spent enjoying homemade apple juice while recounted the past few months to a couple of reporters and a photographer eager for a story. It’s easy for me to become a bit blasé about the journey but in retelling it I’m reminded just what it has taken to reach this point and I’m thankful to those who’ve helped make the journey more than it might have been, including Daniel & Nancy and expat John Galvin. John also happens to live in Bruchsal so we met for coffee and reminisced about all that has happened in the past few months. We first became acquainted in Victoria, Australia where he and his wife Margaret were on holiday, just before my journey started. Daniel’s kind hospitality meant we got to see the region in a more leisurely manner than usual, including visiting the lovely Chateau of Bruchsal that was destroyed during the war but has now been restored. It houses an amazing collection of antique mechanical musical instruments including the organ made for the Titanic but which never went down with the ship due to a delay in the finishing of it. I’m sure there are many who are relieved that for once the order was not fulfilled on time and the consignment missed the journey. There was a poignant film shown of the Titanic’s departure from Southampton on her maiden voyage. Today I’m setting off for Bernkastel-kues on a chilly, overcast day. Hopefully the rain holds off and the weather on the weekend will be a bit more inviting. Riders from various parts of the globe will also be arriving and it promises to be an interesting few days. No points for guessing that FNs could be the main topic of conversation! This isn’t the end of the journey for me as I still want to achieve my goal of reaching the FN factory in Herstal to show Effie where she originated. They haven’t made motorcycles there since the ’60’s so it’s not like she’s going to be getting re-aquainted with fellow vintagettes, she’ll do that at Bernkastel, but there’s a certain nostalgia for me about going back to her roots. Often when I’m riding along I imagine what it must have been like as a young man back to 1910 and how one might have felt with a brand new machine. Proud no doubt, but pretty nervous too perhaps, with the roads far from pristine, not a clue what to do should the engine fail, with a dozen levers & controls to manage and the fear of something going amiss with only a basic hand book to assist…sounds a bit like me today but without the handbook! Happy New year Jos & Christiane! May it be all you wish for and great in 2013 once the summer arrives. Woo hoo! So proud of you. And what I’ve really loved is hearing of the incredible kindness and generosity shown by so many along the way. Very humbling. But looking forward to seeing you back in Oz. Thanks for your good wishes. Yes, it’s true, people have been amazing everywhere I’ve been. Our friends here in Belgium, the Netherlands and Germany continue to treat us so well and I can only hope we can return the favour sometime in the future. Looking forward to seeing you again when we return. Nothing more to be said: You (and Effie) have made it ! Congratulation ! Yes, it’s all over bar the shouting as they say. All the attention has been a bit overwhelming (even having people in a restaurant recognise me from the newspaper article on the weekend! The interest and support has been truly appreciated and now we’re down to the business of packing up and making decisions about the coming year. Alot to think about so just taking one day at a time. Took a look at Effie yesterday in Pierre’s garage and I swear she looked relieved it was all over! Will be in touch very soon re. the transport to take her home. Congratulations with your arrival! You have done it and it is really nice to have read this 14 minutes ago on your twitter message on the website. Well done and what a stamina! Barbara and I are in Andalucia, close to Malaga and will be here for the next 3 weeks or so. If you and Lynne feel like flying over, please do, but you might prefer to come over on Effie. You just caught me writing up all my reports for the week. Yes, we’ve done it! It felt quite like a guy on his first date riding towards the factory with the anticipation high and the adrenalin pumping. Definitely a highlight for me, especially as I was accompanied by several great friends and Lynne was there to meet me. Malaga sounds nice but we’ve only got a few more weeks left on our visa with still quite a bit to do here. As tempting as it sounds (especially after Lynne’s recent trip to Spain) I don’t think Effie’s really up to doing any long trips at this stage of the game. I’ll restore her back to new and we plan to return to Europe in early Spring, do the London to Brighton in March then on to the USA – so a lot to look forward to. A couple of months rest in Australia will be nice as winter is approaching fast here. It only seems like yesterday we were all enjoying India together and I’m sure we’ll catch up with you & Barbara next year somewhere along the track. My son Erik (the Canadian on the UK plated 1200 GS) met you yesterday when you set off from la Roche de Ardennes, Belgium. He’s been riding since he was 5 years old and was fascinated by your bike and your trip. He enjoyed speaking with you and told me he got a lump in his throat just watching you push-start your bike and disappear over the hill. His story about your adventure beat mine, where last week I was touring Pennsylvania and met someone touring on a 1938 Indian. He has owned the bike over 30 years. I leave this message just to let you know your impact to long time motorbike enthusiasts like ourselves is perhaps more powerful than you realize. How lovely to read your post. It was great meeting Erik and his girlfriend when I set off from Roche de Ardennes and to know that he was out there enjoying riding just like me, which is what motorcycling is about – it unites us all regardless of machine or age. I’ll be heading to Canada/USA in 2013 and remember the great roads I enjoyed there many years ago on a GoldWing, so lots still to look forward to. Watch this site for news of the book my wife and I plan to write soon and thank you so much for your kind words. Looks like the trip is going good and strong! Glad to see you are safe and enjoying yourself, and that your great adventure is all you imagined it to be. Your words and experiences are both extremely inspiring and motivating. Makes me want to get out into the world and experience such a journey for myself. Hope the rest of your trip is a safe and entertaining one. I am both jealous of and extremely inspired by your travels. Ride on Grandpa! Lots of love from across the globe. Stay safe and keep on impressing us all! What a lovely to surprise to hear from you and know that you’ve been following my progress. Just made it to the FN factory yesterday (19th Sept 2012) so my goal has been reached. I hope you get to live your dreams, travel a lot and enjoy all that life has to offer. Setting yourself challenges is one of the great pleasures in life and I’m sure you’ll have many adventures of your own. We look forward to catching up with you when we come through Victoria on our way to Tassie in December and hope you’re enjoying the good Aussie life. I never doubted the bike could make the journey, just the distance was a little more than anticipated and the last two thousand kms did have me concerned a little. The engine certainly is tired but with a good overhaul she’ll be right as rain. Have read a few stories about FN’s doing similar trips but they were made in the 30’s so quite a bit easier in many regards. Still a challenge is a challenge and everyone’s journey a worthy experience. Hope your bike will be running by November when we return to Oz. Ron, Wow, now you can sell weight loss programs. 10kg guaranteed! Do we get a photo with shirt off??? Heheheh. Congratulations any way. I hope there is a follow up on your motor maybe with wear specs. Not sure the 10kg is will gone for long given the food, the beer and the chocolates are so good! Lynne & I are beginning work on a book so all the specs will be included in that as I’m sure a lot of people would be interested in my thoughts on how the bike performed. Bad luck breaking con rods. Guess they were original parts. Hope you have no trouble locating replica pieces of better quality. My plan now is to overhaul the engine and take Effie on the London to Brighton next year followed by backroads from New York to California. So a lot of planning writing and adventure ahead! I’m enjoying the eating part – especially the chocolate & beer! I should gain back the weight I lost in no time. Now we’ve made it to Herstal we have plenty to celebrate. The next few weeks will be for sightseeing and making plans for our return to Australia. Have a house-sit arranged over Christmas and plan to spend the next few months writing a book. Thank goodness for my diary and blog – that should make it easier. Look forward to catching up again in Qld in the near future. Now the journey is over & I can relax a little. Having something to plan for next year will stop me from feeling at a loose end. Effie needs an overhaul before we set off on the next adventure. Thank you for sharing this journey with me. Like many of your followers here I’m looking forward to meet you in person on Friday evening or Saturday at the latest. I’m sure you and Effie will get a lot of attention. Enjoy it! After such an incredible trip you deserve it! Was great to meet you in Bernkastel on Saturday. Thanks for all your help and great photography. Effie deserves the accolades, I’m only the pilot! See you again soon my friend. Hi Ron. Congratulations on your achievement of the first objective way! EFI is a great machine. Still watching your journey! Garden what furniture we have produced works flawlessly! I wish satisfaction among friends. Hi Libor my old mate. You were sadly missed at the rally. Lynne was keeping it a secret that you were in the program and what a lovely surprise it would have been to see you there. Still, you were in our thoughts and I’ve no doubt we’ll meet again one of these days. Maybe you’d consider doing the London to Brighton in 2013 on your Laurin Klement as I’m seriously considering taking the FN there before the ride across the USA. Oh so very, very close now. I am sure Effie will hang in there to help you finally achieve the dream that has sustained you for so long. You, Lynne & Effie continue to be such an inspiration to so many, and I am honoured to include myself in that group. Effie sure has come a long way from just being a bare frame at the foot of your bed in Ashfield!! Have fun, enjoy that cold ale or two and just take time out to let your hair down. And be sure eat PLENTY Ron !! Sincerest congratulations making a most remarkable and life changing dream come true. There’s bugger all hair to let down these days but have been having fun anyway. Yes, great selection of the world’s best beers and chocolate and frittes! I may never leave Liege! A wonderful bunch of people here supporting me who have helped make it all so worthwhile. Finally reached the factory yesterday and achieved my goal – 14,606kms. Returning there Friday for an official visit so will write about that on the next blog after today’s gets finished. Effie did a fantastic job and came through in the end – all I had to do was steer her in the right direction. A lot of preparation now for our return home for a few months before next year’s adventure. Look forward very much to catching up – can you make it to Tassie over Xmas? Thanks so much for your continued support and interest in the journey – always good to be riding together my friend. Welcome at Bernkastel-Kues “”Ron”” we are all waiting to see you. And fingers crossed for Effi, but she is so nearly at home (Herstal) she will take care. And about the weather they talk from a smooth 20c° Greetings Jacques. Thanks Jacques. It was great to meet you at last and all the other FN enthusiasts. A wonderful weekend for sure and now ready for the last stage to Belgium. Weather is fantastic today and looks like a nice problem-free ride after Saturday’s repairs. Looking forward to having Effie arriving “home”. hey ron and effie i m from belgium and i hope to see you somewhere, its amazing what you are doing and i hope one day i can do thinks whith my FN sahara just like you do !!! verry verry nice, maybe i see you on saterday in bernkastel !!!!! !have a great trip to england ! Hope you enjoyed the weekend in Bernkastel as much as I did – it was great to meet up with so many enthusiasts, including yourself and all those from Belgium. I’m sure your FN Sahara would get you anywhere you want to go in the world. Keep that dream alive! 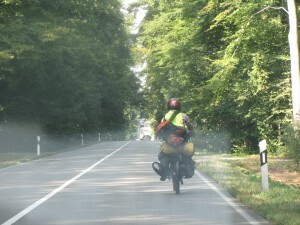 Traffic is challenging in Germany, especially if you are travelling with an old motorbike. I am sure you will make it to the very end. Today you will catch some rain for sure and itnhas become cool, notto say cold. But forcast is promissing tt the weather will improve by tomorrow and it will be already dry. More in the north than in the south. So you are triding into the right direction. Weekend will be dry and sunny with abt 20Cel. Will call you tonight to fix appointment for most probably Friday. Great to catch up in Bernkastel Thomas. Thank you for everything. Had a clutch problem on rally so spent time repairing instead of riding. All good now. Sunny day and good ride ahead for Belgium. Will be in touch once really soon.